In a survey carried out by Ipsos MORI, only 4% thought a new high speed rail line was the best way of boosting the economy, just beating 'Don't Know'. The British public does not think that building a new high speed rail line, such as the planned HS2 project, is the best method of boosting the UK economy. In a new poll carried out by Ipsos MORI on behalf of HS2 Action Alliance just four per cent of the public selected building a new high speed line as the best infrastructure project to boost the UK economy. A new high speed line trails far behind building more homes (40%); improving existing road infrastructure (20%), and improving existing rail infrastructure (14%). Improving and extending high speed broadband is considered the best way to boost the economy by eight per cent of the public. Increasing airport capacity is favoured by five percent of those surveyed, equal with those that replied ‘none of these’. 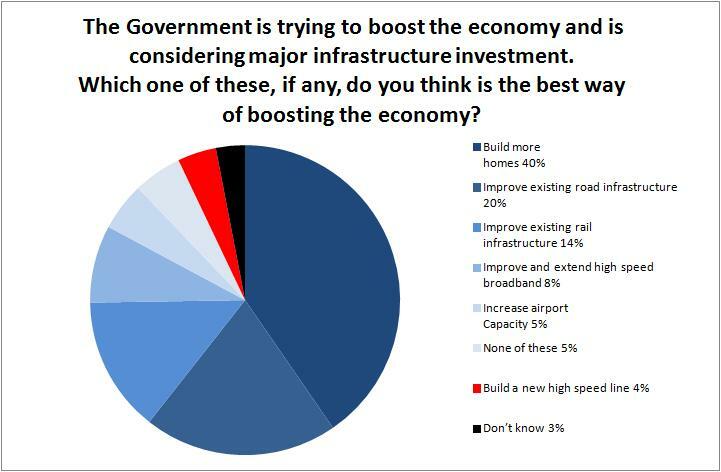 Three per cent of respondents do not know which infrastructure projects would boost the economy. The results showed that building more homes was the most popular choice with 40%, followed by improving existing road infrastructure (20%), and improving existing rail infrastructure (14%). Improving and extending high speed broadband got 8% and increasing airport capacity scored 5%. The full results of the survey are available on the Ipsos MORI website. HS2 Action Alliance commissioned Ipsos MORI to include the question on a face to face CAPI (computer assisted personal interviewing) omnibus survey. Interviews were conducted with respondents in their homes. Euston Rebuild Will Mean 2 Decades of Horrendous Chaos on West Coast Mainline.